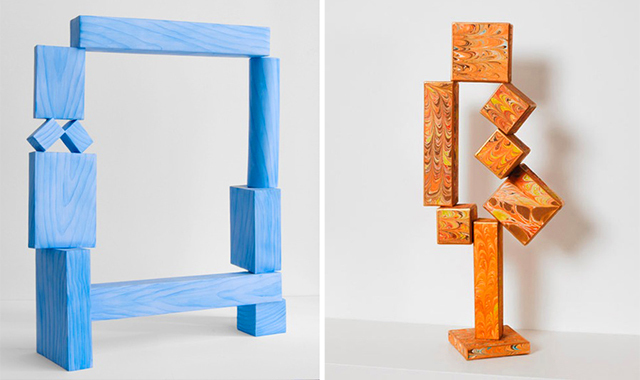 The David Smith estate has informed artist, Lauren Clay, that they do not endorse her copying of Smith’s sculptures, regardless of size, and furthermore, that although they will allow her to exhibit the copies of Smith’s work, they would like Clay to never exhibit the works again or sell them. This entry was posted on Friday, October 4th, 2013 at 12:07 pm	and is filed under Copyright, Feature. You can follow any responses to this entry through the RSS 2.0 feed. You can skip to the end and leave a response. Pinging is currently not allowed. While I think the Cariou v. Prince decision was horribly flawed, I would like to know the specifics of these works in comparison to the originals – size, color, materials – before I could possibly proffer an opinion. For example, if they’re scaled down to fit in a refrigerator and made of Kraft cheese slices, I would put that down to Fair Use. Not so sure materials and size matter here. That’s where the 2nd Cir. really screwed up. Remember that change of medium can still be infringement, and so can size, especially if there is market harm, which the Smith estate could certainly make here. 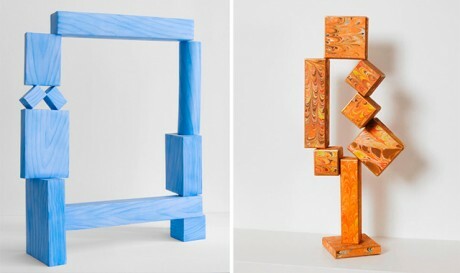 The sculptures shown are made by a woman, from materials (paper) and using techniques (e.g., marbling) traditionally associated with “craftiness” and femininity. They are based on sculptures made by a man from a material (stainless steel) traditionally associated with masculinity, using techniques also traditionally associated with masculinity (welding). At least that aspect of the commentary is clear. Who knows what else might be contained in the work. Smith’s estate is harmed in no way–nobody would buy one of these instead of a Smith. These works also clearly figure into the artist’s broader practice, which does not appear to involve copying. Not allowing her some room to play with art history would be chilling and not worth the trivial (assuming it exists at all) effect that the works might have on the market for derivative works based on Smith sculptures. When you balance cultural value of allowing artists room for free play with the market harm to the copyright owner, there really is no question. Not only should fair use apply here, but as unique works, they should be protected by a safe harbor to prevent harassing claims from overzealous copyright owners. I’m not convinced on both the legal and artistic merits. If in fact criticism is still part of the fair use analysis, and we read it through the preamble of copyright as stipulated in the US Constitution (eg- progress), where is the progress artistically? What Clay has done is no different conceptually and critically than what Eva Hesse did in the ’60s or Rachel Lachowicz did in the ’80s. Where’s the progress? Legally, I’m not so sure about the “no market harm” argument. What if the estate wanted to license out the rights to make smaller versions of Smith’s sculptures, in different mediums? Here it is feasible that an estate and/or foundation would do so, just as the Warhol Foundation does. There’s also no chilled speech here. The problem with Clay is that there isn’t enough speech. Think Time, Place, Manner: I’m not saying she can’t comment on Smith; I’m just saying the way it is being done is nowhere near necessary for the progress of art. There are other artists (see Eric Doeringer and Triple Candie) that make a point of making their criticism of historical artists, movements, and art history quite clear. What’s the criticism here, via progress, that we haven’t already seen? Asking for criticism we haven’t seen before is too high a bar, and not one required by the copyright law. Arguably, it’s not even possible. Aside from technological advances, it’s difficult to find any work that isn’t very well anticipated by earlier work. And from a critical standpoint, tangling out what criticism has occurred in the past and how different new criticism has to be from preexisting criticism is the wrong thing to ask judges to focus on. Also, your “market for derivative works” argument proves too much, for if we were to accept it, virtually no artworks that cite earlier artworks would be permitted as fair use, which would certainly have inhibited the development of art history had artists followed that advice strictly. Finally, Clay’s criticism of what are iconic modernist works is quite clear, and to say it’s not new is unfair. Eva Hesse did not use marbling, as far as I’m aware. And to preclude such variances in criticism (even we were to accept that they contain nothing new at the core, which is a dubious proposition at best) would prune the artistic tree to a stump. I agree that news ideas are tough to come by, but I think it would be a mistake to use copyright law to prune the artistic tree into a bare telephone pole. Why don’t you provide the direct comparison instead of showing only Clay’s work? How can you say to a certainty that Lauren Clay didn’t just knock off David Smith, albeit in a different material and scale? That’s why Cariou is actually a good decision; it acknowledges that the artist’s self-serving rhetoric is meaningless and looks to the artwork itself to see whether there is comment and transformation. And there isn’t, in the comparison of the two works I linked to.